A return visit to the Woodins Shades yesterday morning. I was hesitant after my last visit. But this time, it was much better. Sat towards the rear of the pub and enjoyed a much better quality ale than last time. The selection this time around was Youngs Hummingbird, St Austell Tribute & Nicholson's Pale Ale, Sharps Doom Bar & Two Tides, Black Wolf Florida Black, Windsor & Eton Knight of the Garter & Fullers London Pride. Better. Busy pub close to Liverpool Street station. Beer in good condition, as you would expect from Nicholson's, but atmosphere not very appealing somehow. 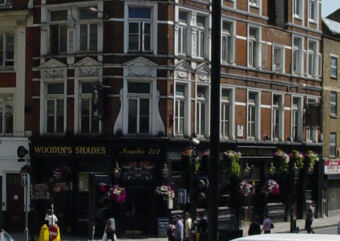 A Nicholsons pub, like many in the centre of London these days. Their website stated that this pub opened at 10am. The CAMRA website stated that it opened at 11am. At 11:25 on Saturday, it was still closed. I decided to visit Dirty Dicks instead. After workmen outside there had managed to drill through an electricity cable and leave it in darkness, I manage to escape and retreat to Woodins Shades, which was now open and reasonably busy. Many people had moved there from Dirty Dicks, when they could no longer see what they were drinking. Ales were Brains The Rev James, Fullers London Pride, Truman's Runner, Caledonian Deuchars IPA, Wadworth Chilli & Chocolate, Harviestoun Bitter & Twisted & Nicholsons Pale Ale. I went for the Chilli & Chocolate and it was vile - well past its best. The food looked better than the beer. But that was never going to be hard. Slightly more expensive than others in the area but genuinely nice. So much quieter than whetherspoons and with miles better food (standard Nicholsons' style menu). Busy at week nights but a haven of peace on a Saturday lunchtime. 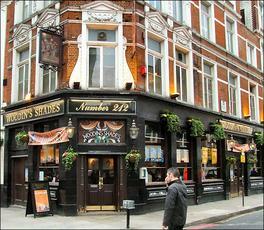 Popular Nicholson's corner location pub with seven casks and some "craft" keg. Crowded. Was a wine bar from 1863 until converted to a pub. OK.